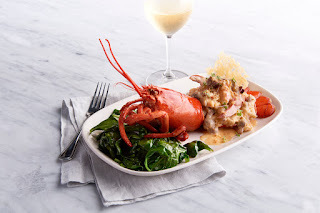 Oceanaire’s tribute to this ruby-red crustacean includes a first course choice of velvety lobster bisque or a fresh lobster chopped salad; followed by a luscious lobster risotto and the main course of a 6 oz. stuffed lobster tail with a rich and creamy truffled lobster thermidor. For those wishing to pair the trio of shellfish with the perfect vintage, a bottle of California’s Cakebread Chardonnay is offered at $75.